This generously-sized and semi-detached holiday home in a secure gated community is ideally suited to families and small groups and sleeps 8 persons in comfort, space and style. Elegantly furnished in an eclectic mix of antique and modern, the home has three levels comprising 3 double bedrooms (master with marble en suite); a 4th bedroom/media room perfectly suited to teenagers (with 2 large single beds and chill-out lounge area); a separate bathroom servicing the 2nd and 3rd bedrooms; a guest toilet and powder room adjacent to the large living area; a separate formal dining room for sophisticated entertaining; a reading area with comfy reading lounge; a fully-equipped gourmet kitchen; and laundry facilities. The home has two sun-drenched terraces overlooking the sea. The main terrace has extendible awnings for shade in peak summer and is equipped for alfresco dining with a large gas-operated grill and outdoor furniture. Complimentary, high-speed internet WiFi is included for the duration of your stay. Elevated Location, Stunning Views, Local Amenities: Located high on the headland overlooking La Herredura (the horseshoe) Bay and adjacent to the renowned Cerro Gordo National Park, your holiday rental home is positioned at the very heart of the Costa Tropical in Granada Province. From the two large private terraces you will enjoy unsurpassed views of the Mediterranean Sea and the surrounding coastal mountain range of Cerro Gordo - perfect positioning for a cocktail at sunset or a lazy alfresco breakfast in the sun. At the base of the hill lies the historic village of La Herradura, which is a favourite destination for Spanish and international holidaymakers seeking an unspoilt haven for seasonal beach and water sports activities, hiking trails, horse riding, recreation facilities, and stunning natural attractions, complemented by a range of speciality and convenience shops, cafés, chic restaurants, and lively bars and nightclubs. Fresh local produce and seafood markets, cultural outlets and pure Andalucian style are beckoning! Holiday Activities Galore- Sun/Sand/Golf/Boating: Your holiday destination will be everything that you hoped for, with a large communal pool and tennis courts and the extensive nature trails of the Cerro Gordo National Park all just a short 100m walk from your front door. Discover private seaside coves and beautiful beaches with reserved dining and relaxation facilities along the rugged coastline of the magnificently unspoilt Costa Tropical. Enjoy pristine diving and snorkelling locations in the Marine Natural Park; world-class charter boating and marina facilities at the nearby Marina del Este (5km drive from La Herredura); or subterranean caves nearby the resort town of Nerja (10km). Crave the hustle and bustle of larger urban towns? It's a pleasant drive to Almunecar (6km) and along the coast road through Salobrena (22km) onto Motril (33km). Wish to venture further afield? Enjoy the thermal waters of Alhama de Granada (84km), the majesty of Alhambra Palace in Granada (84km) or go winter skiing in the Sierra Nevada (87km). Getting to La Herredura to Start your Holiday: The vast majority of inbound tourists to the Costa del Sol and Costa Tropical regions land at Ruiz Picasso Airport near Malaga (83km from La Herredura). Airport shuttle coaches deliver passengers on a high-frequency timetable to Malaga city centre and the central bus terminal, for a very nominal fee. Inexpensive local coaches run to regular daily timetables from Malaga central bus terminal to La Herredura and return. Once you arrive in La Herredura, it's a short 3 minute taxi ride to the house. Taxis are freely available in La Herredura and reasonably priced. For those first-minute needs when you arrive, there is a small supermarket on the beach-front to the western end of La Herredura, where you can purchase everything you might need. Many other speciality shops, cafés and eateries are located along the beach promenade. The master bedroom is serviced by a private en suite bathroom which is fully tiled in marble. Facilities include shower, toilet, basin and separate vanity storage unit. A generous mirror, exhaust fan and good lighting are installed. Tastefully decorated with soft towels and small ornaments, the en suite has contemporary appeal. The main bathroom is located on the 2nd level and services the remaining two bedrooms on that level. This bathroom is also fully tiled in marble. Facilities include a shower, toilet, basin, separate vanity storage unit, mirror and lighting. This bathroom is similarly decorated with soft towels and small practical ornaments. A small guest bathroom is located on the 3rd level adjacent to the living area. This bathroom is fully tiled in ceramic white and is tastefully furnished in a modern minimalist styling. Facilities include toilet, basin, mirror and separate vanity storage unit. The guest bathroom is decorated with soft towels, flowers and small ornaments. We offer complimentary, high-speed internet WiFi for the duration of your stay. Our home is set high on the hill, in a secure gated community, overlooking La Herredura, the Cerro Gordo National Park and the Mediterranean Sea. The views are endless and the facilities of Los Altos de Carmenes are unsurpassed. Quiet streets and the proximity (100 metres) to the fully fenced, resort-style pool and tennis facilities ensure the safety of young children and the quiet enjoyment of our guests. Facing south, the area enjoys the very best of the sub-tropical climate of the Costa Tropical. Balmy summer evenings are spent sipping cocktails or dining alfresco on the terrace, as the moon rises to light up the tranquil seas. In the days ahead you can enjoy the wonders of the outdoors, hiking along rocky shores, through the mountains or frolicking in the warm waters of the Mediterranean. Restaurants, bars and cafés abound in the village just a few minutes away and active water sports facilities are aplenty from the main beach. Find a secluded, private cove..... paradise found! Per concedere la quinta stella ci sarebbe voluto un tavolo da 8 in terrazza per poter mangiare tutti insieme e qualche sistemata alle serrature dei bagni. The house is roomy and well equipped. The views from the kitchen and the balconies are spectacular and the living area is spacious and comfortable. The fittings and furniture in the house are of a high standard - nice TVs, kitchen equipment and comfortable beds. It's a very pleasant place to spend a holiday. I'm happy to recommend it. The pool is large and was never crowded when we were there. A car is necessary. The agent (Rachel) who dealt with us was very professional and helpful. Thankyou for your kind review of our beautiful home in La Herradura. The views are indeed very special and are the main reason we chose this property. From the elevated terraces the mountain and sea views along this beautiful coastal section of Spain are truly stunning. We are pleased that you found the house to be nicely furnished and inclusive of all you could need during your holiday. But we are especially happy to be able to share our lovely home with travellers who enjoy it so much. Thankyou also for leaving the house clean and tidy on your departure. We spend 1 Week here in March2015. A wonderful holiday in this excellent house. 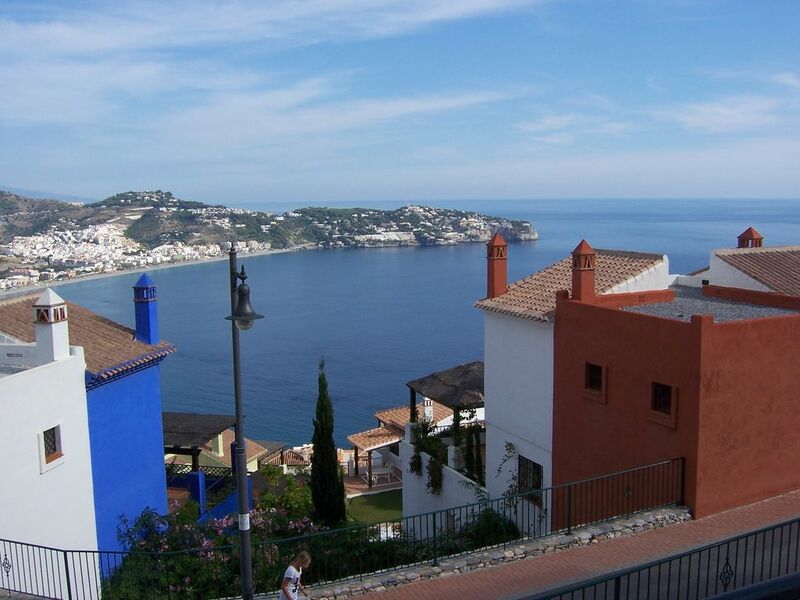 very spacious and tastefully decorated.Very comfortable bedding .quiet and great view over the bay of la herradura. will def come back again ! Magnifica casa e increíbles vistas!! Excelentes instalaciones en urbanización muy tranquila, donde pudimos disfrutar de unos días de piscina y padel. La casa es muy amplia y cómoda, tan solo deberían dotar a la casa de televisión en español, ya que solo vimos canales por satélite de toda Europa menos de de España. Seguro que repetiremos!! Thankyou for your review. It is pleasing that we continue to maintain our perfect 5-star rating from all of our guests - meaning that everyone is enjoying our house and its many features, including the spaciousness, the quality of furnishings and inclusions, the wonderful terraces and certainly the magical views over the mountains and the bay. The location of the house is ideal being just a little away from the township to avoid the crush but close enough to easily access the great bars, restaurants, markets, shopping and tourist activities by car. And everyone enjoys the serenity of our two terraces overlooking the majestic views! We thank you for staying at our house and we appreciated you leaving it clean and tidy upon your departure. We will happily welcome you back again should you wish to stay in La Herredura in the future. In one of the highest seaside vantage points overlooking the horseshoe bay of La Herredura, (the tourism gateway to the Costa Tropical), our house is adjacent to the Cerro Gordo National Park and offers magnificent views of the nearby mountain ranges and expansive Mediterranean sea views. The unspoilt, Andalusia-style village of La Herredura lies between the coastal resort town of Nerja (a holiday hotspot, famous for its subterranean caves) and the historic town of Almunecar (founded by the Phoenicians over 3000 years ago) with its cobbled streets, a Moorish castle and busy urban centre . The shoreline of La Herredura forms one of the most attractive bays along the southern coast of Spain, with its two large natural promontories, the Punta de la Mona and Cerro Gordo, protecting a beautiful 2km-long sandy beach. Easily accessible for visiting tourists, La Herredura is just 70km east of Malaga, from where coaches to La Herredura depart regularly. Granada is just 85km north. Golf: The nearest golf course is Los Moriscos Club de Golf located on the beach front near Motril, some 25km to the east of La Herradura. With 18 hole course, driving range, clubhouse and restaurant facilities the course was founded in 1974 and has a well established membership. The course is relatively flat terrain with two lakes and is rated at Par 70 with an overall length of 5702 metres from the men's tees. All rental equipment is available including electric carts. Green fees are approximately Euro 40,00 for 18 holes and Euro 25,00 for 9 holes. The Baviera Course, designed by respected golfing professional Jose Maria Canizares, is an 18 hole course characterised by wide greens and unsurpassed views of the mountains and the Mediterranean Sea. The Baviera Course is located at Caleta de Vlez, some 32km from La Herredura. The course is rated at Par 71 and has an overall length of 5,609 metres from the white tees. Green fees are approximately Euro 55.00 for 18 holes and Euro 35.00 for 9 holes. Other courses are located in Malaga, some 80km to the west of La Herredura. Ski: The ski areas of the Sierra Nevada National Park are a winter wonderland which is easily accessed from La Herredura. Interestingly, at certain times of the year, it is possible spend the morning snow skiing and then drive back to the coast for an afternoon on the beach, due to the unique geography of the coastal region that forms a micro-climate insulated from extreme cold. The Sierra Nevada ski fields are located a short distance from Granada, which is approximately 80km from La Herredura. All equipment for skiing and snowboarding is available for rental at the ski fields.